This cake was a variation on Mich Turner's 'Art Nouveau' cake from the book The Art of The Cake. I loved the simplicity of the design and thought that it would be a lovely cake for my sister's birthday. 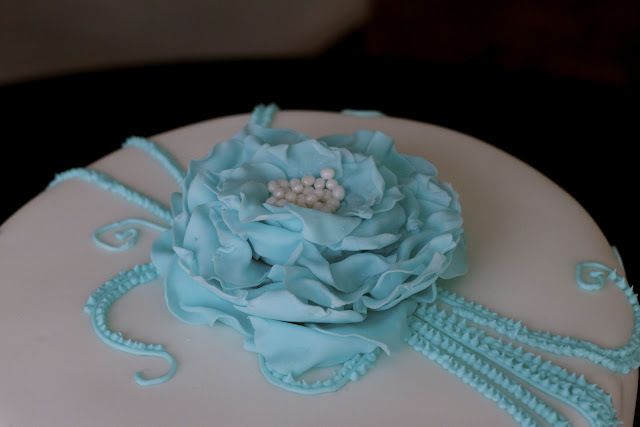 Instead of the simple 2 layer flower on the cake in the book, I decided to try to make a more full and ruffled bloom. I used modelling paste to make this flower instead of gumpaste as the modelling paste takes a little longer to dry and gave me more time to manipulate the petals. I discovered in this process that I do not like my plastic ball tool. It actually has a seam in it that catches the modelling paste on occasion and tears or comes close to tearing the petals. I think that investing in a metal ball tool would be worthwhile for future flower-making attempts. The centre of the flower is filled with little balls of modelling paste lightly brushed with lustre dust. 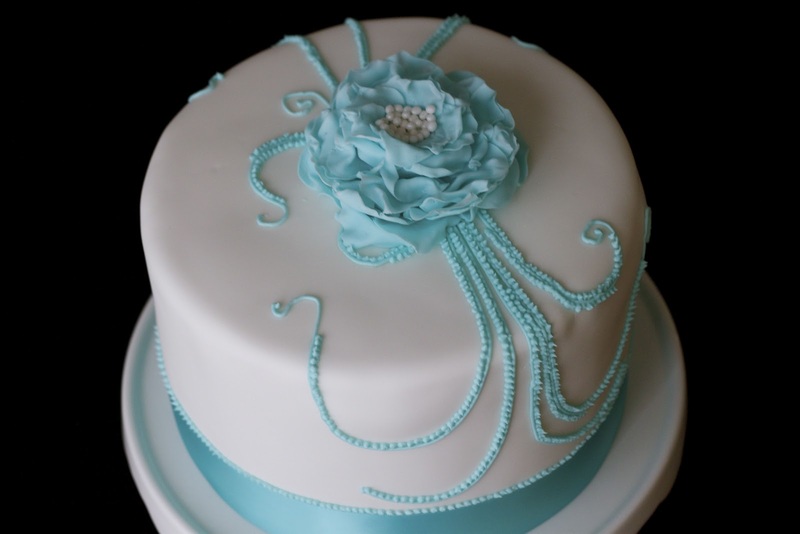 The swirly design is piped on with royal icing. The book offers a template however I just freehanded the design. I did use my inscriber tool to lightly mark where I wanted the swirls. You don't want to be too heavy handed with this as your royal icing 'strings' may not fall exactly where you want them to, especially when making big swooping swirls on a larger cake. Speaking of larger cakes, this cake is shown as a cute little 4-inch cake in the book. If you want to do a larger cake (this one is an 8-inch cake), be prepared to have a lot of patience piping on the little accent dots. My nephew thought that the design on this cake looked like an octopus. I guess at age 7, you are more likely to associated swirls with an octopus rather than art nouveau. The cake itself is Sweetapolita's Vanilla Bean Latte Layer Cake with a few minor variations in the buttercream. My swiss meringue buttercream recipe makes about 8 cups of buttercream so I used 2 vanilla beans in addition to a teaspoon of vanilla extract, and increased the instant espresso to 1 tablespoon + 1 teaspoon. I love the look of buttercream speckled with vanilla bean seeds. The cake flavour was nice although I felt the texture was a bit dense. It may be that it is the intended texture of the cake or perhaps I over mixed the batter, although the cake layers rose quite well in the oven. 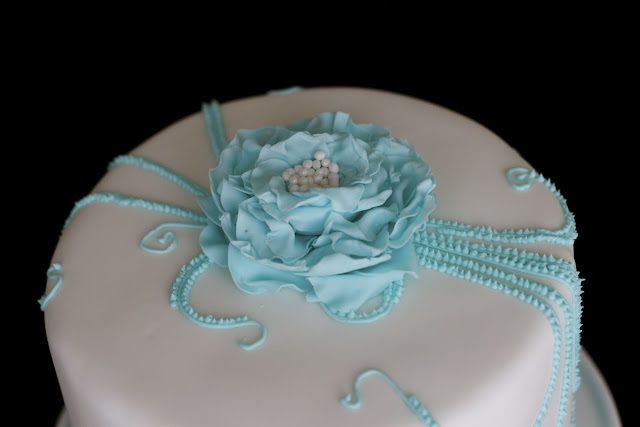 The flavour of the buttercream was wonderful and it gave me a great idea for another May birthday cake. Stay tuned!